After last week’s Fox News interview with Robert O’Neill, two of the members of SEAL Team 6 involved in the raid that killed Osama Bin Laden have gone public with their stories of what’s already one of the most legendary US military operations in history. This public profile goes against decades of SEAL culture. 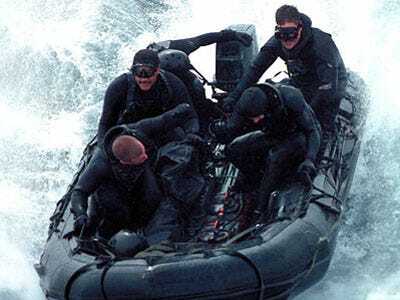 Before O’Neill’s interview and Matt Bissonnette’s best-selling book partly about the raid, the SEALs — and Team 6 in particular — were known for being highly secretive. Officially, the team’s name is classified and not available to the public. Technically, there is no Team 6. A Tier-One counter-terrorism force similar to the Army’s elusive Delta group, Team 6’s missions rarely become public. The Fox interview with O’Neill, who claims to have killed Bin Laden, is a major break with decades of SEAL protocol. But so is the government’s entire handling of the Bin Laden raid, the details of which have been widely disseminated in the three years since. It shows how important the publicity about Bin Laden’s killing is to the US that Team 6 was front-page news, or that a movie like “Zero Dark Thirty” was ever made — the latter thanks to a series of leaks by top defence and intelligence officials. The members of Team 6 are all “black” operatives. They exist outside military protocol, engaging in operations that are at the highest level of classification — and often outside the boundaries of international law. To maintain plausible deniability in case they are caught, records of black operations are rarely, if ever, kept. Joe Skipper/ReutersU.S. Navy SEAL Team 18 members with a multi-purpose dog take part in a demonstration of combat skills at the National Navy UDT-SEAL Museum in Fort Pierce, Florida on November 11, 2011. The development of SEAL Team 6 was in direct response to the botched 1980 attempt to rescue the American hostages held in Iran. The failure of a US mission to extract the hostages illustrated the need for a dedicated counter-terrorist team capable of operating with the utmost secrecy. The Team was labelled 6 at the time to confuse Soviet intelligence about the number of SEAL teams in operation when the team was formed. There were only two others. ReutersFour US Navy seals jog at the Philippine Navy headquarters in Zamboanga City, in the southern Philippines on June 17, 2002. Team 6 poached the top operatives from other SEAL units and trained them even more intensely from there. Even among proven SEALs the attrition rate for Team 6 is reported to be nearly half. 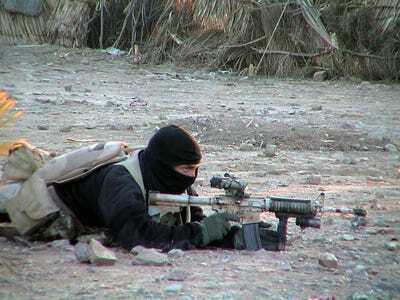 The CIA also recruits heavily from their numbers for their Special Operations Group. ReutersA US Navy SEAL member provides cover for his teammates advancing on a suspected location of al-Qaeda and Taliban forces, January 26, 2002. This report is originally by Robert Johnson.